After his crowd-pleasing Zatoichi remake back in 2003 Takeshi Kitano’s output suggested a filmmaker struggling to find new stories to tell. Both Takeshis’ (2005) and Glory to the Filmmaker! (2007) felt like navel gazing with Kitano reflecting on back on his career, while his recent Yakuza movies Outrage (2010) and the sequel Beyond Outrage (2012) were tired rehashes of themes he’d already covered in his early films. 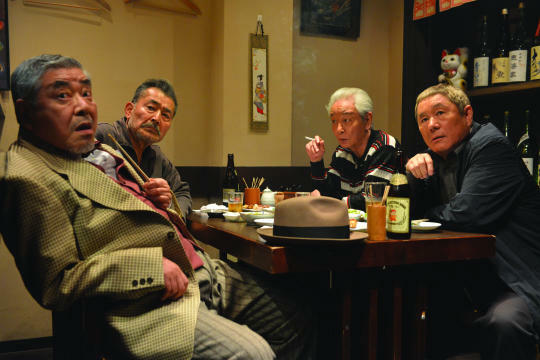 Though ostensibly a Yakuza movie Ryuzo and the Seven Henchmen sees Kitano returning to his comedy roots for a broadly comic farce about ageing. (Tatsuya Fuji) is a quick tempered former Yakuza enforcer now living with his salaryman son’s family and something of an embarrassment to them. Frequently told to cover up his tattoos for fear of damaging their reputation in their nice neighbourhood Ryuzo ambles around with Tokyo with his best pal and former lieutenant (Masaomi Kondo) gambling in arcades or betting on what customers will order in fast-food restaurants. After almost falling for a telephone scam organised by the young Keihin Rengo gang who run their criminal empire like it’s a corporate business, Ryuzo reunites the few remaining members of his old Yakuza clan. These include street con-artist Mokichi (Akira Nakao), Steve McQueen fan ’Mac’ (Toru Shinagawa), and ‘Stick’ Ichizo (Ben Hiura) who like Zatoichi carries a cane with a hidden blade. Later they’re joined by a kamikaze obsessed pilot (Akira Onodera) they meet at a protest rally. Kitano gets plenty of comic mileage out of a group of pensioners being violent but there’s an obnoxious lowbrow element of toilet humour present. Fuji (once the star of In the Realm of the Senses) is in great shape for a 74-year old and could easily have played this straight had Kitano opted for a more serious approach. Kitano turns up briefly as a cop who preferred the old days when you knew who the criminals were. Ryuzo and his Seven Henchmen might not quite be the return to form admirers of Kitano’s sublime 90s’ output (Scene at the Sea, Sonatine, Hana-Bi) are hoping for but it does at least suggest there might still be time for him to deliver a late career renaissance. Another Japanese veteran with an erratic track record, Miike Takashi, also offered an atypical approach to the Yakuza genre. Yakuza Apocalypse is a chaotic gangster/horror movie mash-up featuring vampires, martial arts mayhem, and a supernaturally-powered ruthless killer in a giant frog costume. Personally I prefer Miike on more restrained form, (Audition & Hara-kiri) but Yakuza Apocalypse is good fun with some interesting ideas, vampirism as a metaphor for crime (civilians taste nicer), prisoners taught knitting to control their tempers, and a Yakuza refusing to get a clan tattoo because his skin is too sensitive.